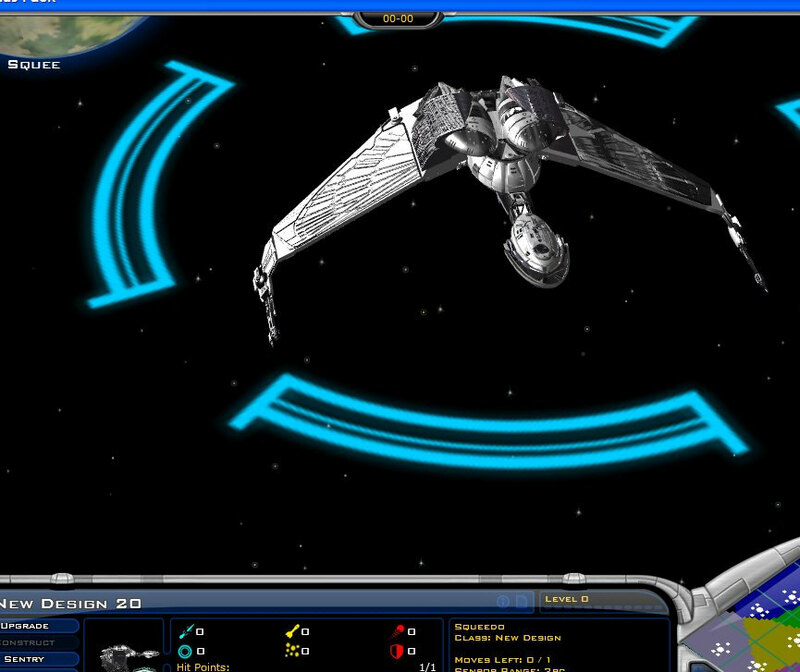 Wing Commander Mod for Galactic Civilisations 2? Some of you are maybe playing Galactic Civilsations 2 in the future. As I know from the Homepage oft this game, it will be a "Modder-friendly" one. And as you know lot of Modding-projects for Space-conqering games (like Conquest Frontier Wars or Homeworld) failed, because the games have been difficult/impossible to modd. As you cen guess, I have no clue of modding a game. ... But maybe there are poeple who are interested in such a modd and HAVE a clue how to modd games. As far as I know the "only" problem is: There are no carriers in the game. So you could add Ships like a Bengal Class, but they will have another fuction then a carrier. But it would still look cool to see such a ship with some fighters arround, attacking the enemy. Just like in the Video someone did about the Tiger's Claw attacking Kilrtahi Starbase at Venice. But beside the "problem" of not having a real carrier-class-ship, you can modd everything in the game. From the Beams to the pictures and movies, EVERYTHING!!! I know Moderators and Admins HATE doubel Posts, but as far I can see no one else can say something to a Wing Commander Mod for this Game. But lot of peopel start to complain about the strategic deepnes. And as far as I know there areno official Mod-Tools released yet for this game. Graphic looks really good, if you ask me. Iit would be a shame if Wing Commander stays back of Star Trek here. I would start a Modd myself, but I am not good at programming or 3D-designing. And about the Strategic deepnes of this game. Read the Game Experience of the Users ("Journal Section") and you know what I mean. The Reports are reading themselfs almost like one of the Wing Commander stories about the Kilrathi War. And if you watch the Description of the Ships, it is almost like you read them from "Claw Marks". And if we talk about Modding. In some sases there is Wing Commander almost already in the game. Am I right if I say this Ship comes close to a Ralari? What I am planing for myself, doesn't matter if there Will be Wing Commander Modd or not. I will create 2 own races. One will be the Terran Confederation and athe other (yes of course ) the Kilrathi Empire. As Avatars I will take Pictures of Trakath or the Kilrathi Emperor (Wing Commander 2 or 3, still not decided) and for the Terran Confederation Admiral Tolwyn will be the man in charge. I try to include the "Logos" oft he 2 "Empires". So the Terran Star and that Kilrathi Empire "Symbol". If there is Music if you open diplomatic screen, I will use the Kilrathi/Trakath-Theme of course. But I have not decided what Music I use for the Confederation. This isn't really a double post. But lot of peopel start to complain about the strategic deepnes. And as far as I know there areno official Mod-Tools released yet for this game. So Galactic Zivilizations is Moddable right away. I don't think people are seriously working on Star Wars EAW mods. I think the reason this thread hasn't gotten any replies is because not very many people play Galactic Civilizations. I think that first ship is very different from the Ralari. The second one only has a bit in common with the Raptor. Neither would really be suitable for a WC mod in their current form. an interesting note on galactic civ II is that it has become the #3 selling game this week... with how Civ IV did, it gives a new life to the 4x turn based game market. I haven't bought it yet, but a friend of mine told me that it uses .x model format for all of its ship design, that is a simple directx file so putting WC models into the game would probably be fairly easy, less easy is texturing. From what I understand the color schemes are applied in game using vector graphic drawings.. so I dunno if it will be possible to stick in a stiletto with a nice confederation logo on each wing. food for though... I'll probably buy this when I see how the user reviews pan out. Thank you for forgiving me my "double post"
Well, "close" is maybe the wrong word. But if you see the "basic" in the design, the "splittet front" and the bridge in between (like the ralari has) and the side-wings, it is the basic-way the ralari is designed. I know the Ralari is much thiner and not that "fat" and has guns at the end of the wings (think those things are guns, Sorry if I am wrong). Anyway I still think it comes pretty near to the design for Wing Commander Ships for a "Non Wing Commander Game". Same with the "Raptor like Ship". But that's my view of the story. Of course it is NOT the same as if you ad the REAL Wing Commander Ships to the game. But the clue of this game is that you can design the Ships as you like. So maybe there is a way to get closer to a "real" Wing Commander Ship then the examples you have seen so far. I also got the news that the game got sold pretty often this week. On the offcial Page there is already a modding-forum, nut much or real informative post though, but the game ist still new, so let's see how things are going. I think I heard that the game was the #3 on the "best selling" list this week. Is it know if their are any tools for modding and how much can be done with these tools? Also when modding the game, what are your plans? Do you want to do a TC or just bring in the ships? Also what timeline are you aiming for? I think their is much to think about when starting modding this game. Modding "GalCiv2" makes some more steps forward. There is a guy in the GalCiv2-Community who already made some nice models and has in mind to make a modding tutorial for GalCiv2. Would mean that ANYONE could modd his CalCiv2 by himself. You can download the Files and try to include the model textures. If you have GalCiv2, of course! A tutorial would be nice (well, great!) because everyone here might have his own favourite Wing Commander "Episode" and likes to include it to the game. @ "gevatter Lars" Well, are you here to post your doubts or are you interested in a modd for this game? It is maybe not you intention, but you questions just sound like you have many doubts. I can not do more as everyone else, as you and your team for "WCSaga". Try my best and to hope everything works fine and will result to be one more support for Wing Commander and it's fans. And I hope there will be people who are getting interested in creating a WIng Commander Modd for this game. I don't expect you should shout "Hurrai! ", because everything is still at the very beginning. So you will see soon enough if my intention of making a Wing Commander Modd will succseed or not. Hope it helps you to get your opinion about the game. I have both doubts and interests. Personaly I would more like to have a good "cap battle simulator" with a little or no industrial managment. Games like Empire at War, Haegemonia or Nexus for example. Still a good mod of GalCiv might also catch my interest. About my questions....I think that this are points that should be clear to you before starting anything because you need to aim at something. Just starting somewhere will most likely bring you nowhere. I think that makeing a total conversation of Galciv2 will take a lot of preparations before you start anything. For example how will you integrate the WC technologie? Will you have fixed designs that are exactly like the game ones or will you do the quite oposite and give the player total freedom in what he does...or mix it, giving the player the hull and hardpoints and he can then add the weapons, armor and shields he likes. Thats an one of the importend parts because I think if you give the player total freedom of what to do in this part it comes quickly to the point...is that still WC or just something with the name and similar look? As I said I have other interests, but still I wish you good luck with your project. PS: A game I would still like to see a mod for is Conquest frontier wars. It had many of the elements of WC like the jumpoints, similar ship classes and so on. Sadly their aren't any tools for it. Reminds me what happend to Conquest2? Yes a Wing Commander Modd for Conquest Frontier Wars would be great. But it seems as long as the Developer doesn't offer offcial and usable Tools it's impossible to Modd. 1. Race Creating: Less a problem, the Feasture is lready a standart without big modding. There are already examples for it. 2. Ships: WIthout the propper Ships the Modd is useless. The only "bad" thing is the game itself loses it's freedom to create you self desigend Ships. but if you like top play it with the "original" Wing Commander Ships you don't care about that feature. 1. Changeing dialoges/text in diplomatic-screen. Think less a Problem but maybe much work. 2. Changing Nam of Planets. Think also a minor Problem. And maybe to change the look of the Planets. The you should change the rays of the Energy-Weapons. Original if a Enegery Weapons fires. the "beam" looks like in Star Trek. Hell, you all know what I mean. The biggest Problem is to create Carriers. The "Problem" of Galciv 2 is, that there is no Carrier-Class Ship. That means no "Hangarmodules". So that could be real tricky. Of course you can have Carriers like the Tiger's Claw, the Concordia, Victory or Midway, if you have the 3dModels but without launching or landing of Fighters. They would be "normal" CapShips. As much as I like the GalCiv series, it just doesn't seem like a good match for a mod to me. Space Empires, with its wormholes, system arrangement and tactical combat, would make a far more satisfying game. O.k. then make a Modd for Conquest Frontie Wars. I would truly support it. Well if you are honest there is maybe NO Space-Strategy Game (Turn based or Real Time) who supports all "features" that benefits Wing Commander. Well except Conquest Frontier Wars. But who wonders? It's a Chris Roberts Game (or Chris&Erin Roberts game). Nexus looks good, but there is no Space-Conquest mode. Could be something, but you can only battle in Planet Orbit O.k. sometimes in Asteroid fields, depending on the Map, but no batlles in the "Free Space" between the Planets. Then you must limit the Game to 2 Races. Then you have to figure out the way for the also Important ground Battles, to let them look Wing Commander-Style. I Think pretty difficult, because Wing Commander is more about Space battles. Beside the Hover-Tanks, that we know from the games and the Kilrathi "Mauler-Tank" from the Cartoon, we don't know much about Ground-Units in Wing Commander. And also this games supports no Jump Points. There are Routes from planet to planet, but I don't consider them "Jump points". It would be more like in Conquest Frontier Wares where you can protect your Jump Points with Ion Cannons (...ready to rumble! ) or Mine Fields. Hell, as I mentinoed CFW would have been the perfect Strategy game for a Wing Commander Modd, but we can do nothing about it. No doubt, Petroglyph has created a very nice game with EAW, but I doubt a Wing Commander Modd would suit it. Well, I talk to long here, just I like to say that every Space-Strategy Game has something that you will miss, because it's different from Wing Commander. So why I like to chose Galactic Zivilizations 2? It's about the Atmosphere and the possibilities because of it's features. that: "Let's see what's out there"-thing and making progresses in economy and technology. The Terran Conefedaration Improved itself (or Herself?) before the Kilrathi War, during the Kilrathi War and after it. And in times of war you may have that kind of "dark" and "desperade" atmosphere that Wing Commander 1 liked to give you, about Situation in the Kilrathi War. Not about the game of course!!! Bacause the Terrans are about to lose and get slauhtered by the Kilrathi. Sometimes it went out good and they turned the tides and sometimes they lost anyway. NOTE: So gevatter Lars gave me a point to think about. It's about working the Modd arround the Tech-Tree or the Tech Tree arround the Modd. The Problems could be that you end up in Mass-Production because it's more important to have lot of ships then a few good equiped ones. So a feeling like having 1-2 "Tiger's Claws" who are going to win your battle in Vega Sector will not exist, becaue you will have to build maybe 30 or 50 of them. Other Problem to avoid is that there is no "Overmighty Ship" that can win the whole War alone. So solution can be: That you can build every Ship right at beginning and the differences are about upgrading them. Or some Ship Classes are not available at the beginning or a mix of that. Maybe there is an experinced Modder out there who knows about such problems and can help me to find an solution. So maybe you like to have some "minor Races" into your Modd, like the Mopoks from Wing Commander 1? ...Anyone who remembers them? But you could include some "lower-teched" Races. Or you like to have the Border Worlds as self-standing faction in the game, allied with the Terran Confederation? No problem! You have it if you like! Like to have the Firekkans in the Game? No Problem! Remember of Transport Escorts in Wing Commander? In GalCiv2 they can also be important. If I am not wrong there are "economy Transports" and not only "militarastic" ones. So remember Missions like escorting a Drayman with Medicine-Cargo? The Planet is screwed if you lose that transport! So you can replay similar situations in GalCiv2. Maybe not THAT critical but with a certain importants. In GalCiv2 you can build Freighters which you can send on a trade route. If the enemy destroyes them you may have financial Problems. So if you was in need of money and the freighters solved that problem, you may have a problem losing them like losing a Drayman with Medicine on board. In GalCiv2 you also are able to build Starbases/Spacestations. And there are no "fixed" building points for them. You can build them wherever you want. And they can be as Important as in Wing Commander. Like for the Kilrathi the Starbase at Venice or K'Tithrak Mang. Or for the Terrans the Navy Headquarters or Perry Naval-Base. And where you start Wing Commander 2? Right, at a Space Station! I know some of you like huge battles where lot of Ships are fireing against each other. But be honest: "How many of such battles do you know from the Wing Commander games?" It's more about some smaller, but good skilled and managed Fleets or Ships against each other, or a Fighter-Squadron against some CapShips. So in GalCiv2 it helps you often more having kind of a "Taskforce" like "Concordia Battlegroup" instead of sending 1/2 or 3/4 of a "cheap" fleet, even if it would outnumber the "Concordia Battlegroup". Depending on the Equipment you gave them (defense and weapons), of course. Imagine: You start as the Terrans, the Space is pretty unexplored and you send a Ship like the TCS Liason to explore Space and now you have first contact with the Kilrathi Empire. So what will happen this time? Would the Liason be destroyed (again)?. Does the Terran Ship open Fire this time? Will they meet in peace? Or the Claw (or a Ship wit the same value for you) succseed at K'Tithrak Mang? Or you play the Kilrathi and try to predent to be VERY kind, peacefull and nice (purrrr ) ...till you have prepared you fleet and you eat the humans a live!!!! Because of all that Exploring, diplomacy, and Fleetcombinations (and building) you can replay certain Situations of Wing Commander in a more proper way. Remember the "Great Assembly" in Wing Commander 4? There is also something like that in GalCiv2 (was already in the first Version). There are different political parties. And also you, as the leader of you Race belong to one. If your party wins the elections you get bonuses, if not you may have a harder time leading your Race into a prosper future,... or war . So that are some Important Points, I think. Of course there are some flaws. Like the "Jump Points". A bigger one is maybe, the missing Carrier- Class. But I hope there is a way to "fix" that. So for me it's not only important what I can do in the game, also what Atmosphere gives the game to me? And Wing Commander, especially Part 1 gave me a special one that I can hardly describe. It's one only really few games give to me. Those are games I will remember for my life. And one reason I liked Wing Commander that much is the Story one big factor for that Atmosphere, no doubt. So a Game with huge Battle may be fun, but if you could build a story arround it, it would make even more fun and drag you more into the game. As many of you I am waiting since a long time for a good Wing Commander Strategy-Game. Real Time or Turn Based, doesn't matter. When "Armada" was released I bought it and couldn't wait to go home and play it. "It's a Wing Commander game, but I DON'T like it!!!" Sorry to all "Wing Commander Armada" - Fans but that's the truth! I Think Armada is the only Wing Commander game I don't like. The Strategypart and the possibilities have simply been too poor for me in this game. Then EA closed Origin and I thought my wish of a good Wing Commander Strategy Game was burried for ever. Since I took notice of people who are creating Wing Commander Modds for different Games. Well, my last real big hope was Conquest Frontier Wars,... well,... you know. But thanks to the WCSaga-team here, I know you guys tried it! So thanks again! And with "GalCiv2" I finally hope to find the solution. It provides Story and Features, in my eyes. "GalCiv1" had already a bit of that "Atmosphere" I talk about, but didn't really reach the goal. But as "GalCiv2" Is much more improved, I think it could do it. So at least I must say, I will try to Work on the Modd as good as I can. Only I have NO experience at modding games!. Anyway, would be a great help If someone provides me with 3dModels and Textures. Ships should be from Wing Commander 1 or 2. 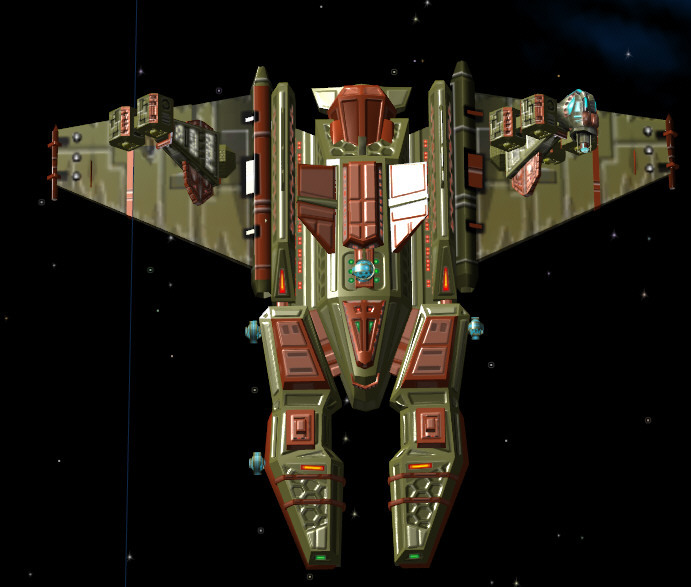 Soem Guy at of the GalCiv2 Community desigend some really nice looking Ships. In my eyes. The Ships he Calls "Banshee Cruiser" and "Ares Dreadnaught" look really good. That also fits my taste of Space-Warships. Something else: When I logged in I missed the "Edit-Button" to my other posts. There is a two hour time limit on editing posts. Yes, but the time difference between 15:15 (CET) Yesterday and 14:22 (CET) Today are more then 2 hours, or not? That's right. You can't edit a post after two hours have passed. Now I got it. Thought I have to wait 2 hours till I can edit a post. Anyway case closed, no need to answer THIS post. Hope next time I can come up with some screenshots "first steps" in modding this game. So, that no one can say I have just a big mouth I had very small succsess in modding GalCiv2. And I remind you that I have NO moding experience before. So here you get 2 Pictures of a Hornet I included to the game. Nice thing: Planets are rotating and Moon surrounds earth. Earth is not surrounding the Sun, but that's o.k. otherwise it would make you crazy. The 3d Model you see was a 3ds-file I converted it into a .x-file with the tool "conv3ds". Here comes the "But"-part. I a matter of fdakt every Ship in Galciv 2 i created of (many) different parts, as Wings, Engines, Weapons,... So maybe I would have to split every Model of a Wing Commander Ship also into such pieces. Could also mean I have to edit/create evey Shippart in order to build a proper one out of it. Nothing impossible, but MUCH work. Anyway, I like to wait till I know more about modding this game. Maybe the solution is easier then I thought (hope so). About the 3dmodel I used: It is not from me, so thanks to the person who offered it. I just don't have the name of the Author. And if we talk about 3dmodels and textures,... I would need someone who officially supports me with 3d models and textures. Next time I like to post how to create custom races. I'd like to include the Kilrathi Empire to the game and show you the result by screenshot. Don't bother with the Ship Design as the Modd is far from "done". But I tried to use that "Brown-Red" Colors as they Kilrathi have them in Wing Commander 1 and 2. The Race Abilities and Technologies, as well as the Political Party, are custumized but I think they fit pretty good for the Kilrathi Empire and for Prince Trakath. That's a neat start. At least it seems to have a compatible color palette. Make sure you add a couple H's to Thrakhath.